We’re inundated with comic book movies and TV shows these days. But for a decade now, we’ve been in the age of the “practical” hero look. And that was fine in the beginning, when everyone was worried about getting regular people to take this genre seriously. But we are far past that point now, and there are some things we demand to see. You know what would really shake up the DCEU and get them out of the “too dark” funk they’re stuck in? Rainbow Batman. Do I care if they go with technicolor Batman whose costume is every color in the universe or with the Batman who has a costume in every color? I do not. In fact, I say to hell with continuity and just have his costume change from scene to scene. The preoccupation with “practical” costumes in movies and television has a number of drawbacks. One is that characters who don’t get a lot of attention get basic outfits that don’t help them stand out. 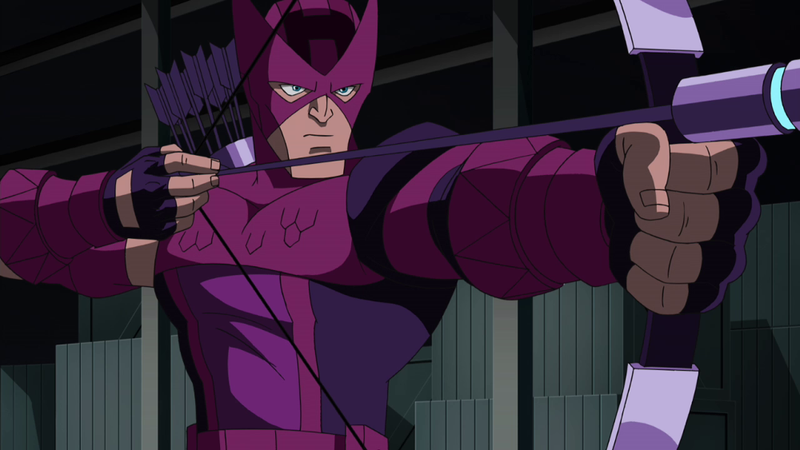 Hawkeye’s weird secret farm family in Civil War was a disappointment mainly because I wanted his actual comics backstory—child archer from the circus—to make it into the movies instead. They could still do it! They can show him in his classic purple outfit in only a flashback and it would have be enough for me. Hell, just put a photo of him in that outfit in his SHIELD file or whatever. Arrow was desperate to make Oliver Queen a more Batman-esque character and infused many aspects of the Dark Knight into his character and setting, resulting in a dark green hood, black show polish over his eyes instead of a mask, a bad attitude, and a city that was needlessly renamed Starling City. Some of that has been toned down over the years—he has a real mask, Staling is now Star City, and then there was that brief, glorious moment Ollie used a boxing glove arrow—but the show should have gone further. Arrow’s Ollie is not the class warrior that he was in the comics, and they ditched all the Robin Hood-themed trappings the character has that paid homage to that. Bring back the mustache and hat. Is this just because hats are fun? Possibly. The X-Men movies were the ones that started all of this—these assholes showed up in black leather and killed a generation of more creative costumes. Yes, comic book costumes may not translate directly to live-action, but basically declaring “black leather jumpsuits for EVERYONE!” was lazy. I mean, Storm got a cape, and that’s kind of all I remember. Hell, the movies are why we never saw Mystique with a belt made of skulls. Instead, she was naked all the time instead. Naked is cool, but skull belts are better. Okay, this technically could have gone in the X-Men entry, but that’s the Fox universe and this is a plea for Marvel and Disney: please give the Scarlet Witch her headpiece back. Elizabeth Olsen’s Wanda’s connection to her famous comics name is a red coat. Now, it’s a cool coat and all, but the thing that makes her character’s look iconic is the big ol’ red thing on her head. Marvel is a conundrum when it comes to costuming. A large number of their characters have costumes that reflect their comic book counterparts, but then there a few whom they have just given up on doing justice to. Why can’t we have nice things? And by “nice things,” I mean Jason Momoa in a) some actual color and b) spandex. We’re all well aware that the DCEU wants desperately to make Aquaman “badass” and that means a bunch of armor and some color bleaching, I guess. But there’s got to be some happy medium between what we’ve seen and what the comics give him. In fact, I actually have some hope that James Wan will deliver a brighter version of this character, since while Mera seen in the Justice League trailer is as washed out as ever, this photo Wan shared is much more what we expect from Atlantis. And if the woman gets the low-cut, form-fitting, bright costume and the man does not, that will be a shame. Villains really get the short shrift in superhero movies. Maybe it is harder to take a villain in an elaborate get-up seriously, especially if they’re meant to be people from our Earth and our time. But that said, Doctor Strange basically had his comics costume in his movie, down to the wild cape and tall collar. The first movie didn’t have Chiwetel Ejiofor’s Karl Mordo as the big bad, but it clearly sent him down the path. Frustratingly, the only hint of his comic book fabulousness was that he wore green. And then, when he showed up having left the Masters of the Mystic Arts, he was in a hoodie. COME ON. If he’s going to fight Strange, he can’t just match him in magic. He has to match him in style. I can feel it in my bones: the DCEU’s Justice League Dark is going to tone Deadman’s look way down. As it is—save for Swamp Thing—the rest of the team is pretty sedate in their original comic book looks. The team for the movie will supposedly be Constantine, Swamp Thing, Madame Xanadu, Deadman, and Zatanna—that’s a trenchcoat, mud and leaves, a dress and jewelry, and a black and white magician’s tuxedo and top hat. Deadman’s the one with the most unique superhero costume, and he should get to keep it. Red jumpsuit with a “D” on it. For Deadman. Freeform’s New Warriors is so going to go for teen-friendly looks. And for Doreen Green, I bet anything it’s like a brown fur coat and some brown leggings. The rest of her look can be tamed a fair bit, actually, but some exec is going to think the tail is too ridiculous. And if Squirrel Girl doesn’t have a giant, fluffy tail on this show, we should refuse to watch. We should, but we won’t. We’re that excited for this. After Captain America: Civil War, Steve Rogers is no longer a sanctioned superhero. In the comics, Steve has abandoned the title and costume of Captain America a number of times. One of those led to the creation of Nomad, who has any number of costumes I would give my right arm to see on Chris Evans. Key to all of them is a very deep v-neck, an exuberant outcropping from the shoulders that are secured by circles, and a mask that covers slightly too much of the face to not look weird. Please, give me this. Make this work, Marvel. You got the star-spangled look to work. Give me this one. What&apos;s The Most Embarrassing Superhero Costume Ever Designed?